Fostering greater mental health and well-being for Texans requires critical policy analysis and decision-making. Unfortunately, the sheer complexity of our behavioral health system is one of the biggest obstacles to understanding and improving it. As part of our mission to transform how communities promote mental health in everyday life, we are committed to sharing information about the policy structures that have a powerful impact on community well-being. 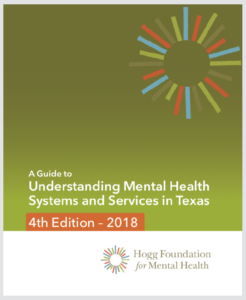 Just in time for the 86th Texas legislative session, the Hogg Foundation has published the fourth edition of A Guide to Understanding Mental Health Systems and Services in Texas. This comprehensive resource is designed to help advocates, policy makers, families and individuals prepare for and navigate mental health systems and services in Texas. Learn more and download the guide. Context for policymakers, advocates and consumers. Bills passed addressed a wide range of behavioral health needs for Texans.